"OLPC's target population of schoolchildren live in nearly 200 countries, where more than 6,000 languages are spoken. The 100 most common languages would suffice for reaching 99%+ of children in first or second languages, but hundreds more would be needed for education in traditional cultures and languages of large populations. OLPC can play a large part in recording and preserving thousands more languages before they would otherwise disappear forever. " 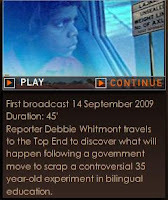 The Australian Broadcasting Commission's Four Corners program Going back to Lajamanu can be viewed online. It examines the history of bilingual education in Australian aboriginal schools. Bilingual education has had a difficult history with varying levels of support from state governments. It is now all but abandoned with English being mandated for the first 4 hours of the school day. The program tells how the then school principal narrowly avoided being dismissed for participating in an indigenous ceremony. It also describes (17:00) how indigenous teaching assistants have been downgraded from teachers to translators under the state education policy. The education minister (13:50) and the head of the education department (16:00) describe the policy of instruction as being 'explicit' about English but seem to have difficulty explaining how to be 'explicit' about the English language . 'Explicit' is also linked with benchmarking. It is evidence of the terminology of explicit or direct instruction and may indicate that the education department is at one swing extreme in the pendulum of instruction/constructivism in the 'curriculum wars'. The 4 corners program gives valuable insight on how the OLPC may or may not be used for learning in students' first language. Very funny at 18:00 where the kids are tasting spices as part of science. IN the murky realm of indigenous policy-making, the darkest, most confused region is the labyrinth of initiatives for education in Aboriginal languages and competing proposals for the preservation of Australia's original words and ways of life.